Fire Alarms, Sprinkler systems, Special Hazards, Fire Extinguishers, Smoke and Fire Door Holds, Testing and Building Warrant of Fitness related services. Alliance specialise in quality fire protection systems which are installed by experienced technicians and fitters to New Zealand standards – NZS 4512 Fire Detection and Alarm Systems and NZS 4541 Automatic Fire Sprinkler Systems. Alliance has IQP registered people providing you and your property its Building Warrant of Fitness solutions. No job is too small or too large – we provide solutions for all types of protection. From a small shop through to a large commercial building, we have the fire protection solution for you that will be of the highest quality, for the right price. There are different types of systems – building size and its use will determine what type is specified in your fire report. Type 3 - An automatic fire alarm system activated by heat detectors and manual call points with evacuation. Type 4 - An automatic fire alarm system activated by smoke and heat detectors and manual call points with evacuation. Type 5 - A Type 5 alarm system is a variation of a Type 4 alarm system that allows the Type 4 smoke detection in specified fire cells to sound a local alarm only, provided that in addition those specified fire cells are provided with heat detection that results in the alerting of all building occupants. Generally used in large apartment complexes. 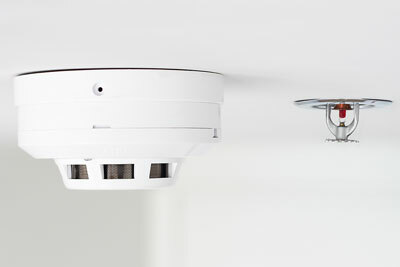 Type 6 - An automatic fire sprinkler system plus a Type 2 manual fire alarm system. Type 7 - Same as Type 6, but with a Type 4 smoke detection system. From design through to installation, Alliance will ensure your system meets the highest standards.